Many of my clients don’t get into speaking because they love being onstage under a spotlight. Although they might enjoy the act of speaking, they’re really drawn to it because they feel compelled to share a powerful, important message. This drive to serve is often what make them stand out as leaders in their industry. 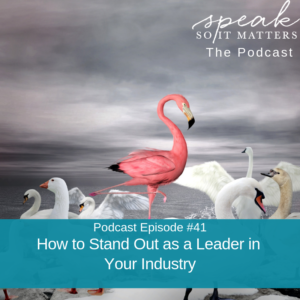 In this episode, I talk about the process to becoming a standout leader in your field. I share how I’ve gone through that journey myself, beginning with my dropping out of a graduate program in order to launch a copywriting business. The path is hardly ever linear! I also walk through the three steps to becoming a leader in your industry: getting clear on your stance, going out to serve your audience, and tapping into your full creativity when you speak. And, I touch on the central component of any truly powerful message – which I call full freedom or surrendered speaking. By the way, I’m running a giveaway for my listeners! I’m offering some of my favorite books – Resonate by Nancy Duarte, Presentation Zen by Garr Reynolds, and Brain Rules by John Medina – as well as some of my favorite candle and notebook sets. All you have to do to enter is head over to the Speak So It Matters page on iTunes, leave a review, and send a screenshot of your review to me at michelle@michellebarryfranco.com. Why your stance has to touch people’s souls if it’s going to matter. How to get clarity on your message so you can speak with passion. How to “be everywhere” when you’re sharing your message with your ideal audience. Why you should use your fullest creative expression when you’re speaking to an audience. That underneath all of the thoughts and feelings you have about speaking is a place of calm, peace, and power. I’ve collected all of the amazing free resources I offer for you, my dear listener, over at speaksoitmatters.com/podcastlove. Check it out! You are listening to the Speak So It Matters podcast, episode number 41. Welcome to Speak So It Matters , where we share a mix of stories of inspiration and super practical public speaking and communication guidance to help you release all the barriers to becoming the speaker you know you’re meant to be. Some of us are called to use our voice to serve others and our world, as well as to become the most fully expressed version of ourselves. If that’s you, you’ve landed in the right place. Let’s do this, my friend. Hello, my friends, my speaker friends, my founders, my leaders. Hello to all of you. I just love and am delighted to be here again, as always. I’m especially excited about today’s topic. Do I say that every week? So, I can’t wait to share it with you. A little warning, I don’t know if you can hear my dog in the background. His name is Timber. He’s sleeping here, but he’s snoring particularly loudly. So if you hear any weird background noise, that’s my boy Timber, who I adore so much. He hangs out in here with me most days in the office. So today, we are going to talk about how to stand out as a leader in your industry. And we’re going to talk about why you want to stand out as a leader in your industry, too, like why even bother to do that. First of all, you probably know that I’m not that into the spotlight and I tend to work with people who they may or may not love the spotlight but their speaking really isn’t about the spotlight. They care deeply about making a difference. Now again, many of my clients and people in my podcast audience do really enjoy being on stage. I would even say I enjoy being on stage, but I don’t do it for the spotlight. I’m going to guess that that’s not what it’s all about for you either, otherwise you wouldn’t be here. After all, we are called Speak So It Matters . So, it’s really about the impact that we make as speakers. So as we venture into this conversation, that’s our backdrop. I know that you want to Speak So It Matters , to serve the people who are in your audience with your story and your message. Honestly, there’s just no more powerful way to do that than to step into leadership in your industry. From this place of leadership, having this seat at that table, the kind of difference that you want to make, not to mention the business growth and brand credibility that you can experience, is just unmatched by any other activity you can spend your time doing. I mean, think about some of the well known leaders just in our world toady. Of course Brené Brown comes to mind and her growing body of work. She puts out a new book, and of course, so she’s an author, right? And she speaks on those topics as she rolls out the book. But, she also is running a very successful business. 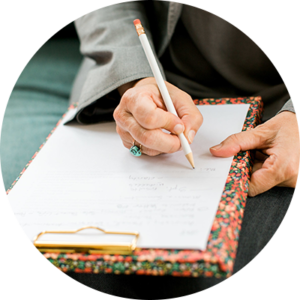 I can’t tell you how many clients and colleagues I have who have gone through her certification programs and who build pretty cool businesses really with that certification at the center. So, Brené Brown is absolutely a leader in her industry. I mean, I think of other people like Elon Musk, of course, because there’s so much in the news about all the things that he’s involved in, but he’s really so into innovation and pushing the edges of innovation. Serena Williams, I was just thinking about Serena Williams today and actually found myself venturing about listening to her thought leadership and her ideas around sports, sport in the lives of girls and how it can really impact their sense of … She didn’t use the word sisterhood. I don’t know why that’s coming to me, but just their sense of connection, their own connection with their own bodies. Really amazing leadership messages there. She’s also taken some other really powerful stands recently from the court. So again, just really stood out for me as a leader. Steve Jobs, of course, who is not in our world anymore right now, but his leadership really stands up as a model and really lives on big time. I was just in a conversation at … Oh, I don’t … I think it was at a dinner with a bunch of other people. Somebody was saying, “This wouldn’t be happening.” They were talking about their iPhone. “This would not be happening with my phone if Steve Jobs were still with us.” So, he definitely … And there were other people nodding and totally agreeing that that is the position that they take. That’s how they feel about the Apple product, that his leadership brought about a much more powerful product, which of course impacted all of our lives, at least those of us who use Apple products, which is a whole heck of a lot of us, right? I think about Stacey Abrams who delivered that very story-based speech during the State of the Union Address this past week. That’s what really struck me as I was listening to her, her rebuttal, the Democratic rebuttal to the State of the Union Address. Just the way she started out with her own childhood story and how powerfully captivating and engaging that is, but how she has stayed in this leadership position in spite of how the election went for her. So, because she’s a leader, because that’s what she does. So anyway, just thinking about each one of these people that I just named … And there are so many. I just kind of picked some that came to me. They stand out in a variety of ways. They come at it in their own ways. But, I want to talk about what they’re doing. What are they doing that allows them to make the kind of impact that they make in their work, in their interviews, in their speeches, all of that? And I want to say, and you know I say this a lot, but it’s because I need to, because I see it missing in so many aspiring leadership speakers in the world. They take a stand for something. And of course, as I often say, they take a stand for something that matters, which of course assumes an audience of people who decide what matters, for whom this matters. So, I talked about this in last week’s episode of the podcast. I think it was called Who Are You to Call Yourself a Thought Leader. We’ll put a link in the show notes. But, I talked about this because taking a stand is at the heart of thought leadership. And if we’re going to talk about how to stand out as a leader in your industry, we have to talk about taking a stand, how you do that, what it means to take a stand. Because getting crystal clear on that stand can be a real challenge. I mean, I spend whole VIP day sessions plus additional sessions with some clients really clarifying what is that message at the center of their thought leadership and their work in the world. So then, what you do once you are clear on that stand to really stand out is the second part of what I want to talk about. So really, it’s about getting crystal clear on that stand. And then from there what? What do you do so that you stand out as a leadership in your industry? So today, what we’re going to talk about what I even mean by a stand and then how to use that clear stand to turn you and your message, your brand, your business into a beacon in your industry, to stand out and make the biggest difference possible. So, I’ve been in business since 2008. I don’t think I’ve ever shared the story of how I got into business, but I’m thinking if I tell you, especially if you’re struggling with your own messaging or feeling really clear on your stand, maybe you’ll feel a little less alone because my path to clarity of my stand has been ever-evolving. You know how they say like … Well, I was going to say, “You know that saying that you teach what you most need to learn?” I will say I’m on the other side of learning this, but dang, if that wasn’t a … It was years long, this struggle. So, let’s go back. I’m going to tell you my founder story, or at least a version of my founder story. So I’m way back. I’m sitting in Sage Cafe, which is this sweet little coffee shop in Bend, Oregon, where I’m living. I’m in graduate school. I’m in graduate school with two dear friends, actually, friends that I made in school. But, we met every Saturday morning for like three hours. It was just these amazing, epic, rich conversations. I had my third daughter, my youngest daughter. Simone was in the sling sitting on my lab. Light was streaming in through the window. I remember this day so clearly. We’re just in one of our deep conversations where I’m a master’s degree in counseling psychology, I think it was called, program with my two dear friends. We’re talking about the program, and it’s a really wonderful experience. I’ve learned so many things. We’re about a year into this program. So, initially I put a hold on my degree program, which I think lasted … You could hold it for seven years. It’s long gone now. But, I put a hold on my degree program and I just sort of started trying to articulate what my business was. Initially, I was a communication consulting business. I made, not kidding, a tri-fold brochure. I think I did it in Word. I spent all kinds of time trying to get it lined up, because I don’t even know Word well enough to know how to space things out so it looks good. Anyway, I created this brochure, this tri-fold brochure basically where I had done-with-you and done-for-you. It was kind of like I’ll help you communicate. Really ironic, isn’t it? That I didn’t really know what I was communicating. I mean, I was basically saying if you’re trying to talk to your clients and customers, let me help you do that more powerfully. Let me write copy with you or for you. Let me write your outreach letters with you or for you. So, I didn’t really know it at the time, but I was creating a copywriting business. I did clients right away. I mean, I sent out that brochure to everyone I could think of. I remember, you know how when you go to a print shop and they put everything in this kind of flimsy box that’s almost like a donut box? I remember that from when I was a kid. And everything’s stacked up in there and there’s a lid on it. So, and I remember it them all being stacked up in there and me taking it out, stuffing them into envelopes, addressing those envelopes, licking them and sending them off. But, I did get clients right away. A few days later, I heard from a realtor friend/colleague who was like, “Yes, I’d love your help with this.” She referred me to someone else. Pretty soon, I had a growing copywriting business. And there was only one problem with this, I hate writing. I can change that now. You know I’ve talked about this. That is evolving. I don’t hate writing anymore. I’m finding some good flow with writing, but man was it hard for me then. It was really painful. While I was good at it and my clients were super happy with what I was writing, it was just like torture for me. So, I figured I probably better pivot before I started to grow a super thriving business that I couldn’t find my way out of. This took me down a path of … Oh my gosh. I can’t even tell you. So, this is 2008 to 2010. I discovered coaching. I got my first coach. I hired an executive coach at the time and learned about the world of coaching, got my own coaching certification, not really sure what I would do with it but knowing that I really wanted to help people free themselves, to express what they wanted to say, to share themselves more freely and I knew that I needed more of those kinds of tools. It’s kind of like what I was looking for in the therapy training. I was everywhere. I remember hiring some really big name people in the business world back then. I mean, like names that you totally know, best-selling authors who were not quite best-selling authors yet, although they were doing really well. I paid like $500, $1,000 for a single, maybe just slightly extended session, which was a huge amount of money for me at the time. But, I just felt so desperate for someone to tell me like, “What should I be. What am I?” And these beautiful, big-named, lovely souls would all say the same thing. They’d say, “Michelle, you’re a speaking coach. Why is this so hard for you?” Because of course, they ask me questions about what I’d done before and my experience. And by that time, I had taught 10 years at the college level in college speaking. I had done speaking since I was in high school off and on, but it was a big part of my life, although I didn’t see it that way at the time. But, oh, man, did I resist being a speaking coach. That’s for a whole ‘nother conversation, because I see this in my clients, too. Maybe that’s coming up for you, too. What I was asking these experts was, “What should I stand for?” Over time, a couple more years, I came back to really what I’d known all along. I remember the poignant moment when I expressed this really clearly years before. This was right after I left the graduate program. I remember meeting one of my dear friends, one of those friends I was sitting at breakfast with, outside of this health food store where we would buy all these preprepared delicious foods. It was Devore’s in Bend. It’s gone now, sadly. I’m standing out there and she was walking in. I was walking out. And she was asking, “How is your business going?” I said, “I don’t exactly know what I’m doing, but there’s just one thing that I know for sure, and that’s that I’m meant to help people say what they’re trying to say more powerfully. I’ve always known that. It’s still what I believe I’m on this earth to say. I don’t exactly know why.” I can tell you my story, of course, about my own struggle with finding my voice and feeling free to express myself. I definitely have a story about that. But, it did not feel like that … like the two were aligned. I just have known that for so long. And that’s exactly what’s at the heart of my stand now. So, I’ve gotten clearer and more specific, of course, based on who I serve. I work with a lot of founders of awesome companies, I mean, award-winning companies. Many of my clients get pulled onto stages. They’re getting requests to speak regularly and they need to filter those request and decide where they should be. Where’s the best place for them to be to represent their brand, to tell that founder story in a way that’s engaging and captivating, and, of course, attracts new clients, and customers, and fans, and also just helps their brand known, brand recognition? So, they need to filter these opportunities. But, I also work with newer speakers in some of my other programs. This is what my Facebook group really has a lot of. I have a good range, actually, in there. But, we have a big range of people in there. I get to also help newer speakers who expect to be pulled onto stages one day on behalf of their mission and their brand and their company, but they’re just not quite there yet. So, they’re still building the story and the message. But here’s the deal, you know my stand. You may not be able to articulate it right now, but this is the stand at the heart of everything I talk about in this podcast and out in the world. And that stand is that some of us are called to share our stories and our experience to serve others. You know this by the fire in your belly to serve in this particular way. Not everybody has that fire. Not every founder of a company wants to get on stages and tell their story. Not every person on a mission, every person building a mission wants to get on stages and talk about that mission in this way. There’s a fire in your belly. That’s your sign. And if you have that fire in your belly, it is my job to help you step into that call to serve as fully and completely as possible. But man, getting to that kind of clarity was years. It doesn’t have to take you years. That’s why I’m here. It’s to shorten that process. That’s why I talk with you about what I’ve used, what I use with clients to help that kind of clarity, and I’m going to give you more of that right now. But, I want you to see through my own story that the path to leadership is often a swirly one. It’s not a straight line for the vast majority of us. These are the stories we need to hear, though, so we all know that we’re not alone, right? So, how do you get there so that you can be telling your story from this place of leadership that you know is meant for you? And my guess is you’re probably already in a place of leadership, but maybe you want to stand out even more as a leader. So, clarity on your stand and then becoming a beacon of light through your leadership is the path to getting there. So, that’s where I want to share with you, is how can you get there. First thing I want to offer up to you, clarity on that stand. Answer the question for yourself. What is the stand that you take? Now, don’t let yourself off the hook on this because this is really essential that that stand be deeply aligned with what you want to say. But, don’t rush it either. You can’t rush that kind of alignment. Let this question and the questions I’m about to give you swim around in your psyche and in your heart. See what rises up. Jot down ideas. Let your creative mind do this deep work. So with clients, we often reveal their stand through what I call story archeology. I ask all kinds of questions about their life and their work, and we focus on the stories underneath. So, yes, of course, they end up explaining things and they tell me about how things work, but we keep looking underneath that for the story. What’s the story of how you got there? Because that’s where the things are going to emerge really naturally and powerfully. I have a client who works in the technology world. And as we were doing that deep, rich work together, she realized she wanted to take a stand for women in leadership and technology. She was tired of being the only woman with a seat at the table on the stages, on those panels. She was certain that the conversation in the technology world would change for the better when more women were seated next to her at the table. So, this came from deep diving on stories of her experience, what lights her up, what she cares about, especially in emerging technology, like augmented reality and virtual reality. You know, there’s a lot of stuff that’s emerging right now that can change, that is changing the course of our lives. She feels really strongly that if we have more women in those conversations, we will do this in a way that serves our world in a much better way. So, you can create your own version of this kind of a process or create it with a friend or a colleague. Here are some prompt questions that you could use. What do I know for sure is true? Why do I believe this? And remember, look for the story that serves that why. What happened in my life and my work that has reinforced this belief? When has this belief been challenged? And what happened when it was challenged? What scares me about saying this? What is my own story about this stand? If I say this stand out loud to myself, what memories come up for me? Again, because when we ask ourself for memories, we’re really asking our brain, our psyche, our vast treasure trove of knowledge for stories. Write everything down if you can. I realize I am saying write everything down as a person who does not want to write things down. I have such a resistance. I don’t think you have to write things down in the traditional sense, but I’m offering this to you as an idea because I find that when I write things down … There’s actually research to reinforce this. I think I talked about it in last week’s podcast that when we write things down and put it out in front of us we actually get some distance from it. And when we get distance from it, we can see it more clearly. So, that’s really why I like to write things down. I used to journal. If you love to journal, awesome. Do that. I don’t journal as much anymore. Actually, I have found that it was not that. It had a negative impact on my life, something we could talk at another time, interestingly. But, I know that there are ways to journal that do not have that impact. But if you like to journal and it’s a positive experience in your life, you might pull out your journal and just jot down what comes of those questions. You can of course type it out on your computer. One of the things I love to do, because I do want to see it in print out in front of me or in type, is I will voice to text into my notes in my phone. If you ever get a text from or an email from me from my phone or anything, there is a 90% chance that that whole thing was done via voice. Because again, resistance to writing and even typing. So, you can use voice to text and just get those ideas down. One of the other things I really love to do that feels freer for me and easier is I put a big piece of paper on the wall. I mean, I should absolutely own stock in the Post-it company for all the Post-it Notes I use from small tiny ones to the big giant ones where I buy stacks and stacks of them for the wall. You can also do this on a white board, of course, which is much more environmentally friendly. And if you don’t need to save it or you’re okay with taking a picture to save it, that can work great. But, just get them, those ideas down. Now again, you can write them down in list form or whatever or you can do a mind map. That’s been a really fun and creative way to bring up other ideas for me. Put the ideas in little bubbles. And then, what does that bubble make you think of? Put the new idea there. What story does that bubble make you think of? Then, of course, sticky notes inside of a folder is another way to get these ideas down in a creative and different way. You don’t have to write it all out. You know your stories. You know your experience. You can use like a three-word slug that represents a story. The time I went to the movies with Lynette, or movies with Lynette. My third grade Valentine’s party. Any of those things just to get some of these things out and ready for you to dig through and explore because your stand is not going to be a … I mean, it might be a surprise to you in that you’ve never articulated that way before. But trust me, you’re going to see the themes in your experience. So once you have a stand that you want to try on, write it really big on a piece of paper and practice saying it, like knowing it, taking a stand for it. Get really connected to it. Again, you don’t have to do this. It’s just a thought. I often I do these really funny things. Like whenever I think of something, a phrase I really love, or a powerful stand I want to take in an upcoming talk … Because of course, in upcoming talks. or blog posts, or podcast episodes, you can take a mini stand that relates to your overall stand. I’ll picture it on a t-shirt. It’s my favorite thing. I’m saying it to my kids all the time like, “We should get a t-shirt that says that.” Or a coffee mug because I love coffee so much. Anyway, getting it on to something, piece of paper’s the easiest, and just hang it up near you. Get connected to it. Practice saying it over time. Be sure you’re deeply connected to with who you want to serve with this stand. I know I’ve talked a lot about who you serve, your ideal audience member. You can go back to many different podcast episodes where I talk about that. I also talk about it in my book, Beyond Applause , which you can get for free through the free resource area. I’ll talk about that at the end of this, but I’ll tell you now, too. It’s speaksoitmatters.com/podcastlove, all one word. I’ve created this special area just for you, you as a podcast listener, to get these kind of resources, including a free copy of my book, Beyond Applause . So, get connected with who you serve with this stand. Who are they? What do they care about? How does this stand make their life better? Your stand only matters if it’s connected to human souls. So, my client serves women in tech. She knows them. She cares about them. She’s one of them. You don’t necessarily have to be one of them, of course, but it does help it make it easier to understand their world. If you’re not your ideal audience member maybe years ago or before your own transformation, you just need to more deeply ask the questions about who they are, what they care about, what their life is like so that as you’re sharing your stand you’re doing it from a place of rich, deep understanding. Okay, that’s the first part, clarity on your stand. Then, what do you do? So, you’ve got a clear stand. Where do you go from there? Be everywhere. You may know that the third step on the path to thought leadership is to go where they gather and serve. So yes, this, go where they gather and serve, but really expand your idea of serving. In this case, I’m not just talking about standing on a stage and speaking. As a leader, you share your thought leadership and your service in a lot of different ways. I have a founder client who has an amazing healthy food company. 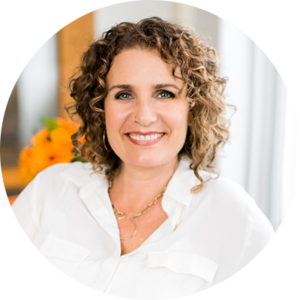 She speaks on all kinds of stages in the healthy food industry. She speaks on entrepreneur stages. She’s interviewed on awesome podcast. She shows up, of course, at food conferences and serves in a variety of ways, in a variety of high-level ways. She wrote two books. She’s been featured in a number of well known publications. So, really think of how can you serve in a really broad way and really be seen everywhere. This is how you as a leader become just a natural thought in people’s mind. Leadership show up. We recognize them because they’re shining their beacon light on behalf of our needs and our desires and our shared mission. So, where can you show up soon and serve through your stand? Now, this might be a chamber of commerce event. It might be a meet-up. So, it can be small, right? You can start small. It might be an industry as a speaker, as a keynote speaker or breakout session, just depending on your access to that event, your excellence at submitting a proposal to speak, your connections, all of that, but an industry event. So okay, you’re showing up everywhere. Now, what do you do as you show up at these events, whether it’s on stage, on the keynote stage, at a breakout stage, or at that table conversation, or walking around the event and interacting and serving in some other way? The third thing I really want you to take with you is tap into your full freedom expression wherever you share your ideas. Have you ever seen Esther Perel speak? I just love watching her on stage. I talk about here in my book, Beyond Applause . She’s on fire. She’s unapologetic about her passion and her ideas. I recently saw Dr. Tererai Trent speak at The Hivery’s Entrepreneur Lab. Wow. That is some full freedom speaking. Dr. Trent is an advocate speaker, author, taking a stand for equality, and education, and women’s empowerment. She is absolutely mesmerizing. When she walks across the stage, she literally acts out certain elements of what she’s saying. I’m not talking about the kind that feels all super practiced and stiff. I’m not saying she didn’t practice, but it doesn’t feel that way, and it makes perfect sense that that’s what her body wants to do as she’s talking about that particular material. She walks from one side of the stage to the other. She uses her voice and with passionate fluctuation. Now, that might not be your style, and that’s okay. But, find that full freedom within you. I’m going to talk with you. I’m going to talk more about how to do that. So, I often describe this as being surrendered on stage, or I call it surrendered speaking. I’m starting to call it full freedom speaking more and more. I’ve been trying to kind of wrap my words around this concept for a while here. There are so many things that you do in this kind of speaking, sure. But, the focus is not on the doing, it’s on the letting go. It’s on the surrender to what’s really living in you to say and the way you’re meant to move. When you’re deeply connected with your content and you’ve released your strong connection with your thinking, which I’m going to talk about in a minute, the way that you move changes so powerfully. The energy and fire that lives in you right now, even as you may not know exactly what you want to say, can show up much more readily from this place. So, how do you get to this kind of speaking? You get there by seeing, and I mean really seeing, that you are fully ready right now to be this leader. You are already this leader. I’m not saying this like some kind of affirmation. I don’t want you to look in the mirror and tell you something that doesn’t feel true to you. I’m saying underneath all of that thinking and constriction in your mind, in your brain is this place in you with so much fire, energy, passion, huge-hearted service. And when you can look in that direction, when you can see, where you point your attention and your focus to that place in you that has always known or has known for a long time that you’re meant to serve in this particular way, the way that you speak becomes so much more genuine, authentic, and real. I know that I’m using big, fiery words like, fire, and passion, and energy, but that doesn’t mean that you flail around on a stage, jump up and down. Your fire, your energy, your passion has a unique expression that you will have a kind of access to that you may not even realize yet because we’re looking in the wrong place for that source of expression. When you keep looking in the direction of this truth, this place in you, and away from anything else that tries to tell you otherwise, you will bring a kind of captivating leadership speaking that will make you stand out, absolutely, on that stage. Your brain will tell that you aren’t experienced enough, that your story isn’t important enough, that this is too dangerous, or scary, whatever idea you have, or even the way that you want to express yourself on stage. Your brain will tell, “Danger. Don’t do that.” It’s our brain’s job to keep us alive, and sometimes it goes a little overboard. It’s afraid. Our brain is like, “Uh-oh. If you go up there on that stage and everybody rejects you, you’ll be left out in the wilderness without your tribe and you’ll get killed by neighboring tribe or an animal, right? Because our primal brain is the one that’s telling us that. But, we don’t need that anymore. You actually don’t need that. You up on that stage as a leader is your greatest service. Keep looking in that direction and know that your brain is going to keep saying things to you. You don’t have to reframe those thoughts. You don’t have to name all of your beliefs and spend hours releasing them. Believe me, I’ve done all that. I used to teach it. It does work for a little bit, meaning you can feel some freedom, but it always fades. It just doesn’t last. And if it feels fun to you do to that beliefs work, or you really love to tap, or any of those other strategies that you’ve use, I don’t want to get rid of everything that you’ve ever loved doing. You can do those things. But, what I want you to know is you don’t have to. Actually, all of that is working with the brain and you can actually just look underneath all that thing. Underneath all that thinking is all the calm, all the peace, all the power that you need right now to serve in the most powerful way. That calm, peaceful place of full freedom lives in you right this minute, whether your brain is on board with your ideas or not. You don’t need your brain on board. Isn’t this kind of a revelation? I didn’t know this. I thought it was supposed to feel awesome, like I was supposed to feel great about what I was going to do, otherwise I shouldn’t do that, like that my feelings … Actually, I’d been taught that my feelings were a guide for what I should do next. And while yes, sometimes it’s useful to tap into our feelings, and we can have a whole ‘nother conversation about that, it’s just absolutely overall not the truth. The truth is we’re going to feel all kinds of things in this life. And when you’re stepping into leadership, and especially when you plan to stand out as a leader in your industry, you’re going to have big feelings in that body of yours. And you know what? You can do thinks anyway. You can do this just tapping into that place in you of fire, and energy, and passion, and deep knowing. So whether you’re getting the intuitive hit to sit on the edge of the stage, to talk more intimately with your audience, or maybe you’re feeling inspired to bring your pet parakeet as an amplifying aid, you’ll be a whole lot more creative and exciting if you’re not looking to your brain to endorse your ideas. Now, I don’t know if you should bring your pet parakeet or if you should sit on the edge of the stage. I’m not sure. It depends on what you’re talking about, depends on the setup of the stage. It depends on your parakeet. I’m just saying your brain isn’t the place to go. There’s that place in you of knowing, of calm, peaceful energy, and there’s a different kind of thinking that you do when you’re tapped into that place in you. Go there, then make your decisions. Sometimes full freedom feels scary to my clients when I talk about it. So if that’s happening for you, I get it. I totally get it. There are so many people out there telling you things that you need to learn in order to be a great speaker, communicator, leader, like that there’s a right way to do this and a wrong way to do this. The truth is leading is in your blood. It’s in you. You wouldn’t be here if it wasn’t. That’s why you’re drawn to this message. I’m not saying there aren’t things to learn. There are best practices to great speaking. We talk about them all the time on this podcast. Brain science nerds unite. I love that stuff. Brain science is useful, right? Tapping into their brains to get their attention, to captivate them, to really move them into their hearts, all of that’s good stuff. Brains are awesome. But, all of that is built on a foundation of your fire, of your desire to serve, and there is so much captivation. There’s so much standing out as a leader in your industry in that energy. Let’s tap into it. Let’s let freedom lead. So, there it is, my friend. You are so ready to stand out as a leader in your industry. You may want to spend some time getting crystal clear on your stand. That’s perfect. Don’t get caught up there. Do the work of it. Find that alignment and then just go out there and start sharing. Your message will shift over time. This can be rich, juicy time. Take a half day or do like I’m doing tomorrow and take a whole day at a local world-renowned spa. Take advantage of their generous all-day pass with one massage treatment. I’m not saying this to brag, really. I’ve been thinking about this for month. But if I go get one … I get a message there. Yes, it’s expensive for that massage, but I can spend the whole day at their facility at this gorgeous, really like award-winning facility and sit in the hot tub and plan out my next talk. I mean, there are all kinds of ways to create a retreat for yourself. Anyway, give yourself the time and space to be creative and to connect with that part of you that really knows. Once you have that stand clarified, be everywhere. And while you’re at these everywhere places, give them all the fire and riches in you. Surrender to your passion and your desire to serve. Let yourself own the stage. Fluctuate your voice wildly in passion. Whisper what scares you. So much gorgeous connection in sharing the fullness of you with your audience of every kind. So, we have a new freebie for you just for podcast listeners. So if you go to speaksoitmatters.com/podcastlove, all one word, you’ll find a treasure chest of resources to help you step into leadership in your industry. You’ll have access to a free copy of my book, Beyond Applause , plus The Path to Thought Leadership e-course, and the Get Started Speaking Guide which has the only presentation outline you’ll ever need. I’m so delighted I get to serve you and I just decided I want to give you the best of what I have to gift, so we put it all in that one place, speaksoitmatters.com/podcastlove. So, that’s what we’ve got for you this week, my friend. I know it’s a little longer than usually, but I really … I want you out there standing out a leader in your industry. You can totally do this. I’m cheering you on, as always. Know that I am. Because remember, you were made for this. I know that because you know. Meet you here next week. Thanks for listening to this episode of Speak So It Matters podcast. If what you heard here today was useful, you’ll love the free guide I’ve created for you at speaksoitmatters.com/yes. Not only will you get immediate access to our Power and Grace Speaker’s Toolkit, including the only presentation outline you’ll ever need, but you’ll also receive weekly updates with our best resources as they’re created. I can’t wait to see you out there shining your beautiful light and changing lives with your message.